If you’re like me, when you decide to learn something new, you want to learn as quickly and efficiently as possible. You want to make sure to stay motivated and work towards your goals. But it’s not always easy to determine that optimal path. To figure out what you should be doing, when you should be doing it, and how often. What you need is guidance. And guidance comes in varying degrees of involvement and rigidity. Optimal progress and effectiveness are usually highest with more involvement and more rigidity. But how do you seek out and find the best form of guidance for you? Let me show you. Let’s take training for a marathon as a guiding example. When you’re learning something — or training, or practicing, or in any way improving your skills in certain domain — there are different levels of guidance within which you can operate. Running, doing pushups. Googling a training regimen and following it on your own. Joining a group running class led by an instructor. Less DIY, but still only one instructor for the entire group. Getting a personal marathon trainer: a one-on-one coach that provides you a directed, personalized training regimen. The least effective and cheapest method is Level 1, the DIY method. The most effective and likely most costly is Level 3, the one-on-one training. The key is that as you get higher in the levels, your training becomes quicker and more effective. You’re in your 9th grade algebra class, and your teacher, let’s call her Ms. Awesomesauce, is doing example problems on the board. Ms. Awesomesauce gets to a problem you just can’t quite understand. When she finishes, she asks if anyone needs additional help with the problem, so you raise your hand. Ms. Awesomesauce comes over to your desk to personally assist you. She knows how you tend to learn best — she’s been getting to know you throughout the year — and she walks you through the problem, explaining it in a way she knows will help you grasp the concepts. And after a few minutes, it clicks: “Ah! Now I get it!” That was a huge help. But why? Because the help you received from Ms. A. was personalized. Whereas the problems on the board were for everyone’s general understanding, the one-on-one help was for your own understanding, and yours alone. Say you hated math. Why were you working on those problems in the first place? Sure, school was mandatory, but, in reality, you could have tried to skip or just refused to do the work. What kept you moving forward and making progress as opposed to stalling and giving up? Teachers are in classrooms to help you learn, sure, but they have another equally important task: to keep you accountable. When you attend a class of any kind, you’re expected to pay attention. The teacher of the class is using their time, energy, and experience to help you. To guide you. You owe it to them to pay attention. To try your best. It’s a natural inclination, and it’s very important. It’s what helps you progress through life. You move from wanting to impress your parents, to trying to learn from your teachers in school, to aiming to impress your boss at work. The two biggest factors in guidance are accountability and personal attention. But why does it often feel like it’s still so hard to make progress when you’re trying to learn something new? Have you thought about how to get personalized assistance? In life, you don’t just magically get free guidance for everything. Your own one-on-one coach doesn’t just materialize at the perfect moment. In the case of personal fitness, for example, guidance can be expensive. Monthly gym fees are costly, and personal trainers are that much more. A personal coach may be hard to find. Or impractical given your schedule. But there’s one important thing to note: depending on what you’re pursuing, you might just not have thought about how to get extra guidance. On the other hand, when it comes to, say, programming, it’s not as natural to reach out for one-on-one help. But that doesn’t mean it doesn’t exist. In fact, you can almost always get personalized help, no matter what you’re trying to learn. 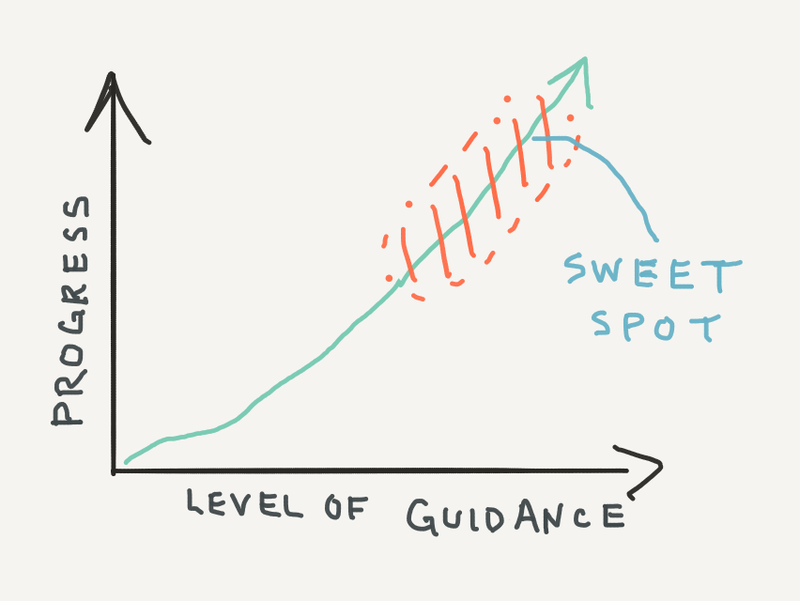 Is extra guidance worth it? If it’s important enough to you, you will find the time and money. If it’s not, you won’t. It’s that simple. And there are various options when it comes to getting extra guidance. You can join a group class, for example, which provides more direction and the chance for at least some one-on-one help. In the case of Ms. Awesomesauce’s class, it was much better than just reading through the algebra book on your own, right? And that’s where the magic happens. That’s where you see your growth explode, as you start shooting up that graph. What are some proven, feasible ways to get that personalized help? There are always way to hack the system. Can’t pay for a class or hire a coach? Try one of these. Gather a group of like-minded buddies interested in learning the same thing as you. Set a time to meet every week. Jam on whatever it is you’re learning. You’ll stay accountable, learn from each other, and have a lot of fun. Think about who you know, and who they know, who has experience in the domain. Ask for an introduction to that person. See if you can occasionally send questions their way. Develop a relationship with them and you’ll naturally receive some of that one-on-one help you’re seeking. If you’re eager to learn and you’re respectful, people are usually very generous with their time. As I’ve taught myself to code over the past decade and watched hundreds of other people do the same, there’s one striking observation that proves true over and over again: the more guidance you receive, the faster you learn, the more effective you are, the more valuable your skills are, and the more fun you have. On the contrary, people who follow courses, find mentors, join groups, or get coaches, tend to excel and are thrilled with all that they learn. And they also have a much clearer path for putting those skills to use to, say, land a job or start building their own applications. I don’t just wax philosophical about all this stuff for my own entertainment. I put it into practice. In my new course, I’ve baked that personalized support right in. Read more about the course now.